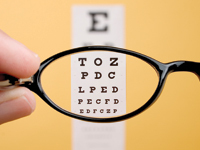 Comprehensive eye examinations should be a regular part of every person's healthcare routine. They are an important tool in eye health by detecting and preventing eye diseases and evaluating the overall health of the patient. Some diseases, such as glaucoma, develop gradually without symptoms of pain or vision loss, so patients may not notice that anything is wrong until significant and irreversible damage has been done. Early detection of eye diseases allows for a choice of treatment options and a reduced risk of permanent damage. Over 150 million people in the United States wear eyeglasses or contact lenses. Glasses and contact lenses improve vision by adjusting the way the eyes bend and focus light. Ideally, light rays are refracted, or bent, as they pass through the cornea so that the image can be focused on the retina, in the back of the eye. In a healthy eye, this means that objects can be seen clearly. Many people have a cornea that has either a shallow or steep curvature that causes light rays to focus either in front of or behind the retina. Objects may appear blurry at certain distances or at all distances. Glasses and contact lenses correct these refractive errors. Prescriptions for each eye are measured for optimal vision clarity, usually 20/20. Eyewear may be used for certain activities, such as reading for farsighted, or hyperopic patients and driving or watching television for nearsighted, or myopic patients. Eyeglasses or contact may be need to be worn at all times. Patients with diabetes are at an increased risk of developing eye diseases that can lead to vision loss and blindness, such as diabetic retinopathy, cataracts and glaucoma. In fact, diabetic retinopathy is the leading cause of blindness in the United States. Diabetic eye conditions often develop without any noticeable vision loss or pain, so significant damage may already occurred to the eye by the time patients notice any symptoms. For this reason, it is important for diabetic patients to have their eyes examined at least once a year. 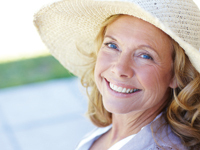 Early detection of eye disease can help prevent permanent damage. Diabetic-related eye problems develop from high blood sugar levels, which can cause damage to blood vessels in the eye. More than 40 percent of patients with diabetes will develop some form of eye disease in their lifetime. The risk of developing eye problems can be reduced through regular eye exams and by keeping blood sugar levels under control through a healthy diet and regular exercise. Diabetic eye conditions develop in the retina as a result of microvascular abnormalities. The tiny blood vessels within the retina develop microaneurysms and begin to leak blood. As new blood vessels develop to replace the blood vessels that are no longer viable, they also leak blood and can cause hemorrhages and permanent damage to the retina.